Yamaha’s MusicCast VINYL 500 is an all-in-one streaming turntable | What Hi-Fi? This is not your everyday deck. Yamaha’s new belt-drive turntable is much more than the aluminium platter, tonearm and moving magnet cartridge that meet the eye. Part of Yamaha’s MusicCast product family, the MusicCast VINYL 500 can stream the vinyl it’s spinning wirelessly to any MusicCast speaker (or speakers) in the house over wi-fi (2.4 GHz and 5 GHz bands). It can also stream files (up to 24-bit 192kHz and DSD 11.2MHz) stored on a network, as well as music from streaming services thanks to built-in support for the likes of Spotify, Tidal, Deezer and Qobuz. Bluetooth and AirPlay connectivity build on the MusicCast VINYL 500’s ruthless versatility too. And if that doesn’t sound 21st century enough for the modern-day vinyl enthusiast, then how do you like Alexa voice control compatibility (via an Amazon Echo speaker) too? 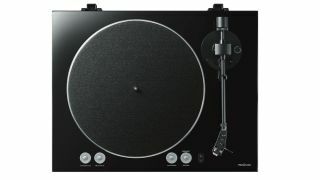 Yamaha’s MusicCast VINYL 500 is expected to go on sale for £549 in November.